Sacandaga State Campground is located off NY 30 along the Sacandaga River. The campground is located in a very scenic section of the river. There are 143 campsites available for campers. The GPS coordinates of the entrance to the campground is N43 21.438 W74 16.973. There is also a nice day use picnic area located along the river. There are many hiking adventures close by in the Silver Lake Wilderness, Wilcox Lake Wild Forest and Siamese Ponds Wilderness. Our recommended hikes in this area include Tenant Creek Falls, Bennett Lake, Middle Lake, Murphy Lake and Jimmy Creek Falls. The Northville-Placid Trail is located nearby to explore. The NPT is a very popular long distance backpacking trail in the Adirondacks. 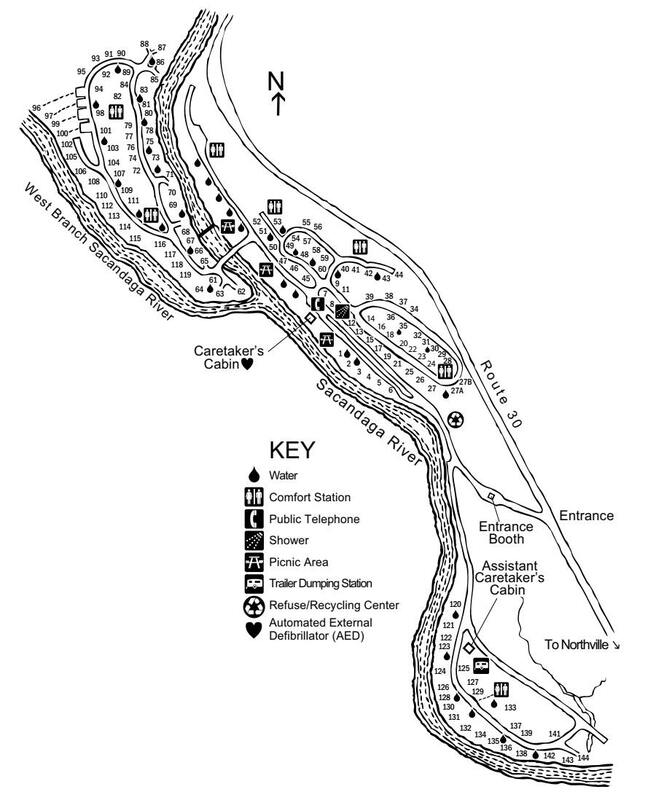 Look below for a few pictures from the campground and a campground map. You can find more information on this state campground, including reservations from the NY DEC website.